There really is a twist or two, or more, to this version of WW, astonishingly, you are encouraged to write about your photos; there is an assigned theme; it happens just once a month; and there is a contest. The fearless shepherd of this endeavor is American Mum, she is the overseer and giver of rules. This week Wordless Wednesday With a Twist theme is A Different View. Take pictures of everyday objects, but from points of view that they aren't usually seen. This is a stack of glasses, ready for beverages, at the Macaroni Grill. I love the deep mix of colors reflected in the clear glasses. That is sure different! I never would have guessed what it is. Awesome! You're right, the colors are beautiful. Amazing colors! Great idea and Happy WWWAT. That is really cool looking! Love it. I really like this shot. What a great photographer you are! I don't think that I've thanked you yet, but I picked up the book at the post office the other day. I've read about three chapters and so far it's absolutely wonderful. Thank you so much. I love the reflections too! Wow that's a great shot! Those are very cool! 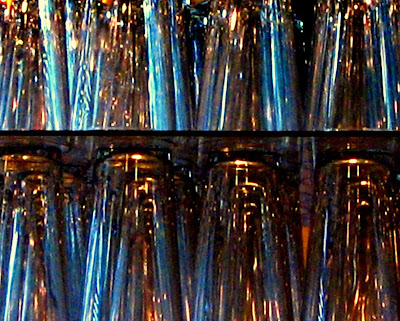 Who knew ordinary bar glasses could be so beautiful?